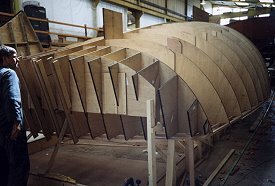 Although most of his work is in completing Marine Surveys, MCA Coding and Recreational Craft Directive consultancy, David also completes 3D modelling of hulls using the Autoship® suite of Naval Architectural software. David has developed some effective methods of transferring traditional lines drawings into a digital format, which can then be used for the production of stability books or for production modelling including plug design. Stability Books for MCA Coding or RCD Compliance can also be completed as well as carrying out inclining tests. David has a set of test weights which are good for craft up to 50ft (15.2m). He can also complete structural assessements to ISO 12215-5 using the Wolfson Unit’s Hullscant® software.